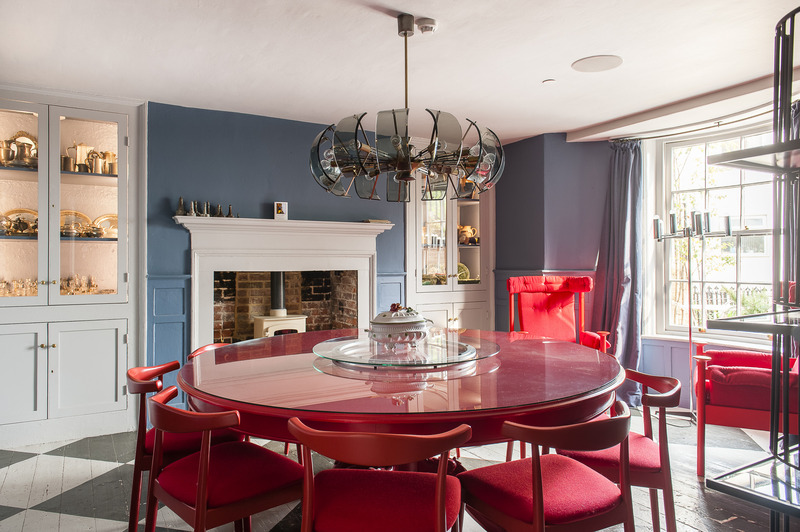 Touring the six-storey House in Hastings with Shaun Clarkson was a little different, more like a master class in interior design, which is no coincidence. 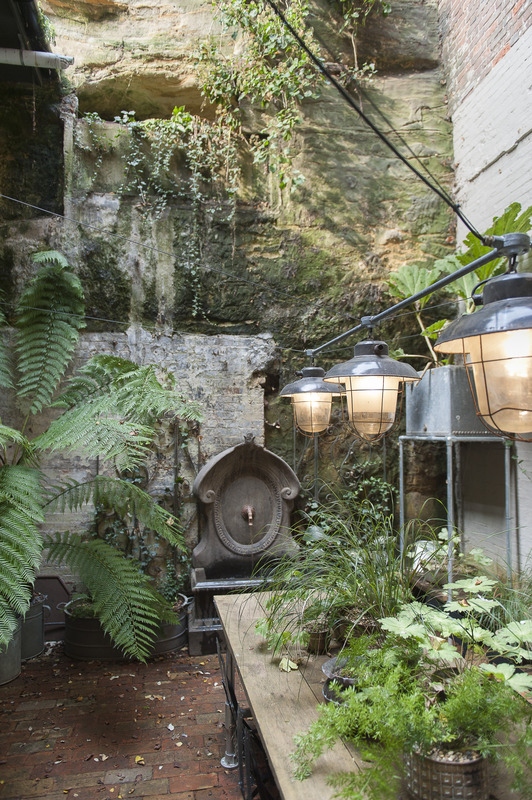 Since the 1990s Shaun has been one of London’s leading designers of bars, nightclubs and restaurants, working with Oliver Peyton on the legendary Atlantic Bar and Grill (ah, youth…), as well as Tokyo Joe, Pop, Jerusalem, Odette’s, Spiga and many others. So if you’ve spent any of your adult life sipping cocktails in sophisticated London surroundings, it’s very likely you’ve sat in one of his creations. 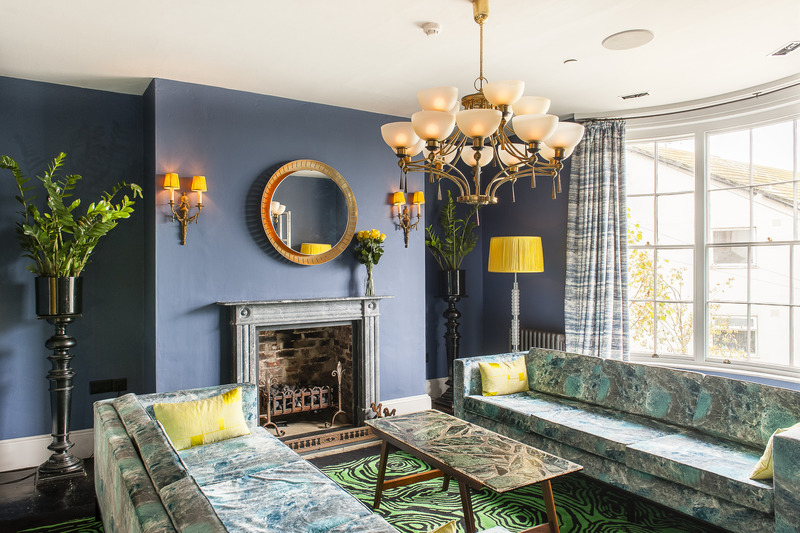 But fun as it is working with the most exciting names in hospitality – and as one of the experts on Channel 4’s ‘Four Rooms’ intriguing objects TV show – at a certain point Shaun and his partner Paul Brewster realised they also needed to do something for themselves, to have their own business. 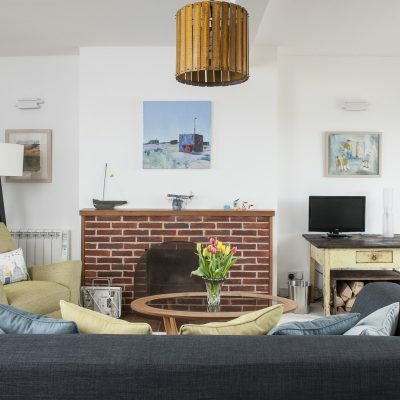 “In 2001, we had the idea for a ‘home-tel’,” says Shaun, “a big house that you could rent for yourself and friends, but not just as a self catering, also with the option to have it all catered. So more like a glamorous boutique hotel, but you take over the whole place. Substitute ‘East Sussex coast’ and the same could be said of The House in Hastings, which is the latest in their home-tel portfolio, although it’s a bit cosier, sleeping just ten people and not designed to be as much of a party house as the two Norfolk establishments. To reassure their new neighbours – some of whom had been a little alarmed by the party central reputation of the Dallas home-tels – Shaun and Paul have had them in for drinks and hosted a Macmillan coffee morning, making it clear they want to be part of the very special close community of Hastings Old Town. Particularly because Shaun already had a very strong personal connection with the increasingly fashionable seaside town. 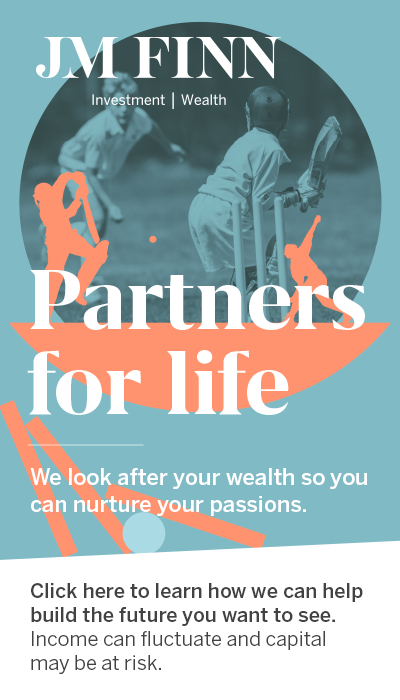 He’s been best friends with Alistair Hendy – proprietor of the amazing AG Hendy & Co homestore, on the Old Town’s High Street – from the age of seven, when they were at school together. 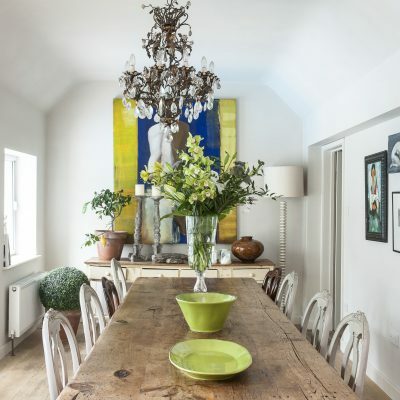 Especially as the Grade II Listed six-storey Regency town house – one of three in a terrace built to house officers during the Napoleonic wars – with the most amazing views over the Old Town and out to sea, had just come on the list of a property auction house. 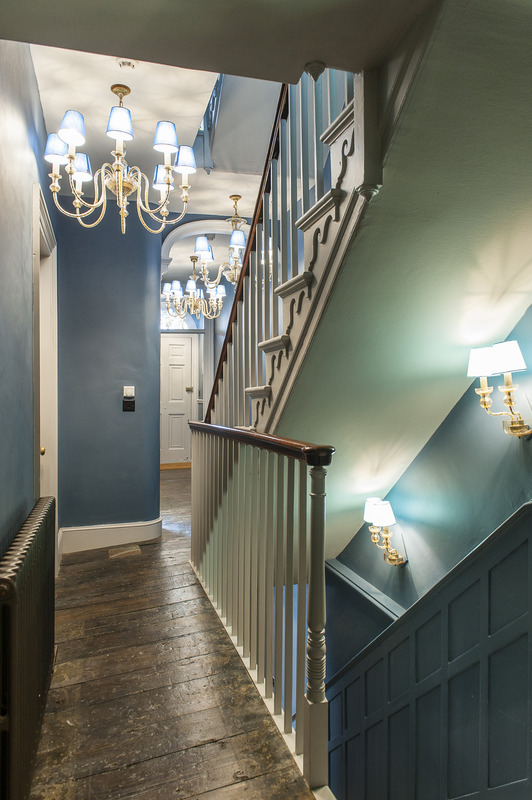 Setting out the framework for this, throughout all six floors the stairs and landings are painted in Mayfair blue by Mylands, which Paul explains, with all the depth of his experience, is the oldest paint company in London, still based in Lambeth and by appointment to Her Majesty the Queen. All the paint in the house is by them. In a similar vein of continuity in both supplier and aesthetic, all the hall and stair carpets are by Designer Carpet, the brilliant bespoke carpet company. 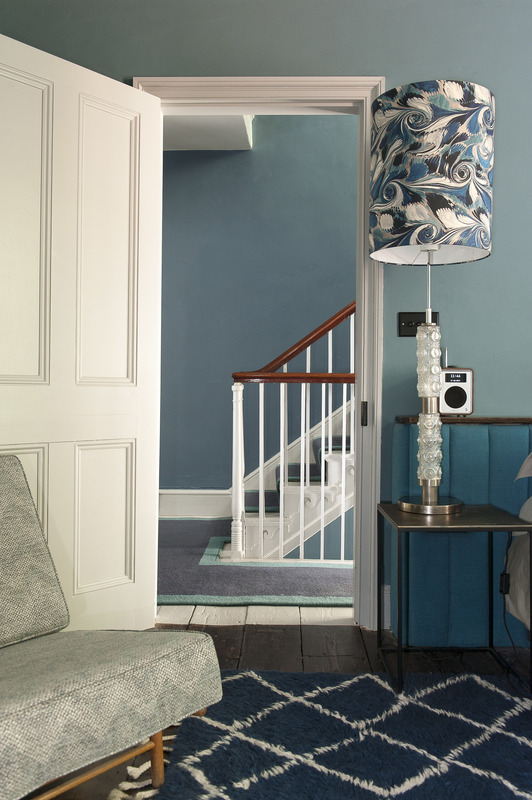 Shaun had them intercut together a dark blue centre, with a chunky sea green border, the edges whipped, creating a core statement of the overall colour theme running through the house. 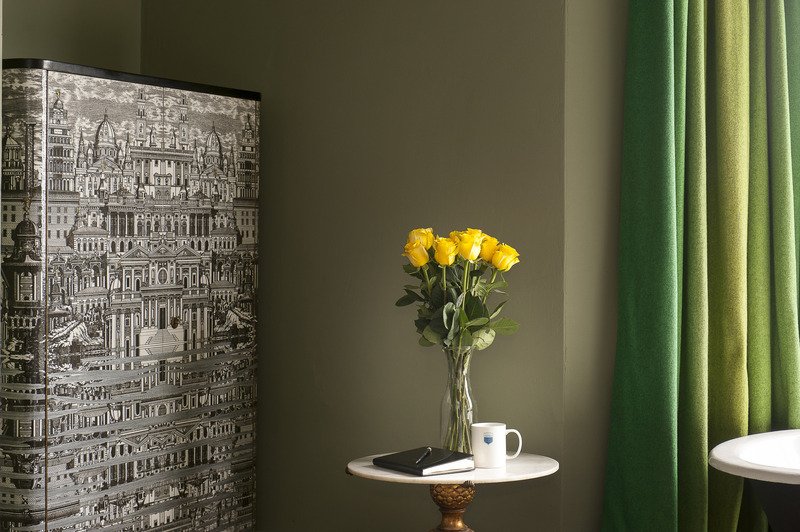 Leading off from it, the rooms on each floor are brought together by a unifying scheme within the overall themes. 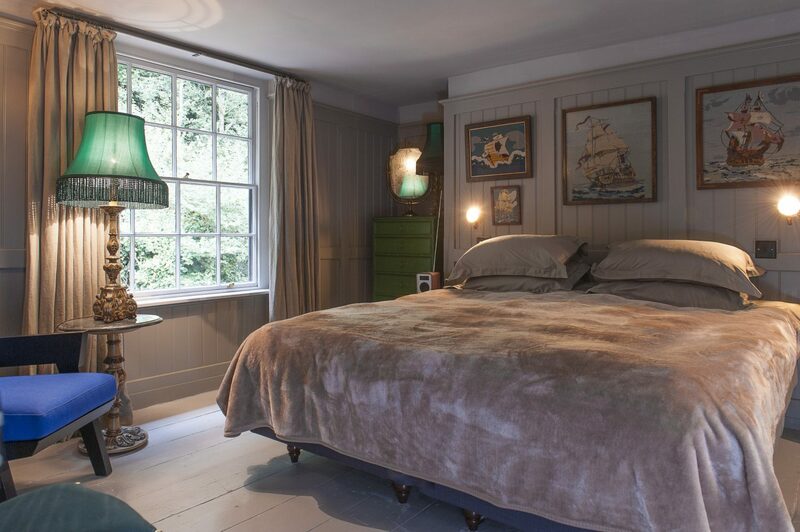 Starting at the top, is the family suite, which includes the Cabin Room, a double at the back of the house, but with the sea brought in via the collection of framed needlepoint ship pictures hanging over the bed. 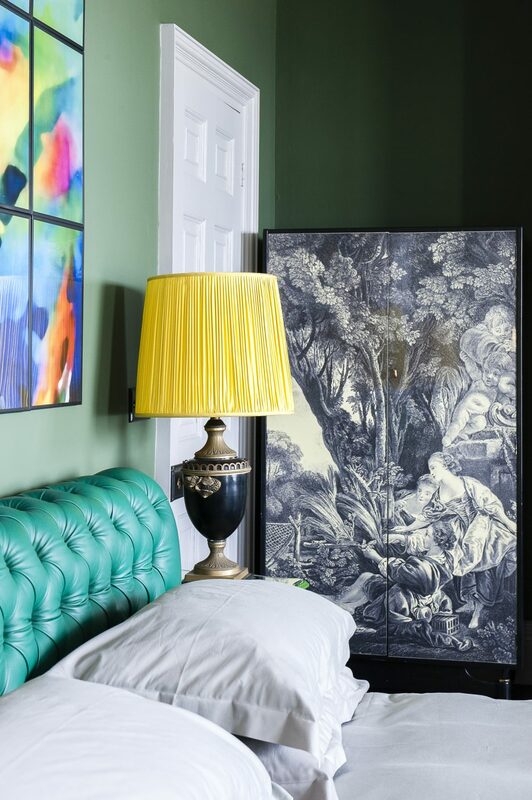 The walls are a gentle sage green, sharpened by a pair of magnificent emerald green satin lampshades, on a standard and table lamp – the first of an array of splendid shades throughout the house. “They are copies of my auntie’s lampshades,” says Shaun. “After she died, I cleared her house and saved her lamps, but the shades were too worn out to use, so I had them copied.” The sort of service he can mention casually – knowing where to get such a thing done. 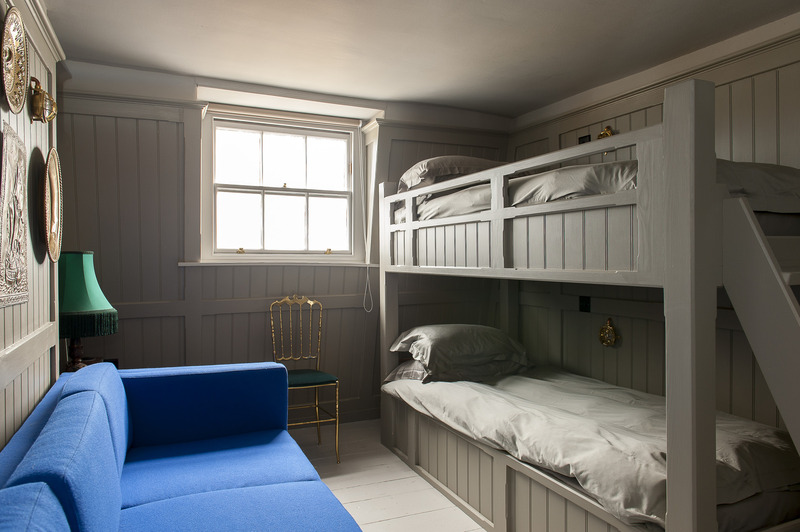 Next door, the Crow’s Nest is a splendid bunk bed den, with a group of pressed brass plates with ship motifs, echoing the maritime theme. 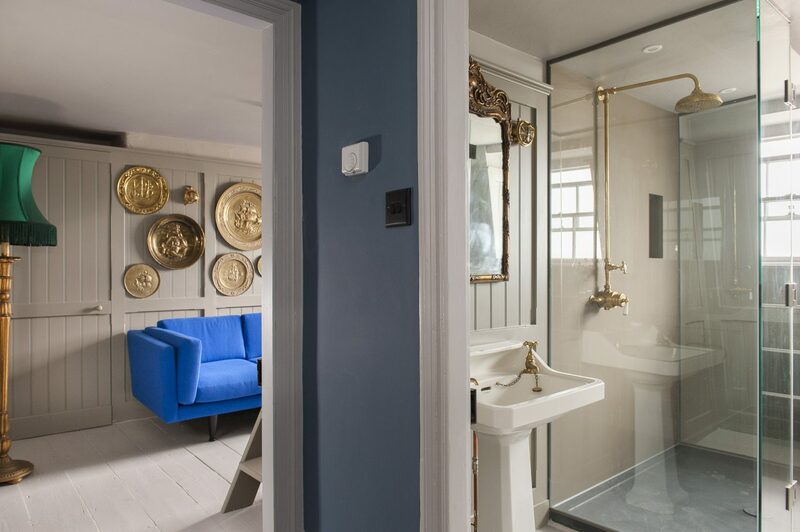 In both rooms, the wall lights are genuine nautical brass bulkhead lights from Trinity Marine in Exeter. 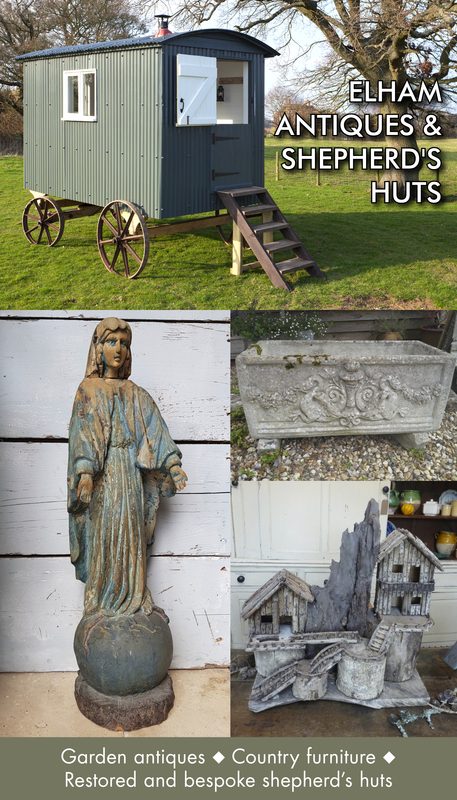 Another insider gem, they are the world’s leading specialists in maritime antiques. There’s yet another in the bathroom. The splendid brass taps are from Barber Wilsons & Co Ltd, also by appointment to Her Majesty – and it would seem to Shaun. All the taps in the house are from there. Just as all the shower cubicles are bespoke, from his favourite source. No tooling around on Google for him. He knows his preferred suppliers and that’s where he goes. Job done. Outside the bathroom is an intriguing group of dramatic ornately carved dark wood pieces – a bench and matching mirrors. I’m scribbling in my notebook trying to describe them, when Shaun chips in. “I had a bit of a moment with the Black Forest bench…” he says, solving my riddle in the first of many such instances when he knows the correct term for things. In the gorgeous Cliff View Room on the next floor down, I comment how much I love the fact that the two (simply heavenly) mid-century Italian chandeliers don’t quite match. “Ah, yes,” says Shaun. “They’re a French pair…” and I have another new term for my interiors lexicon. 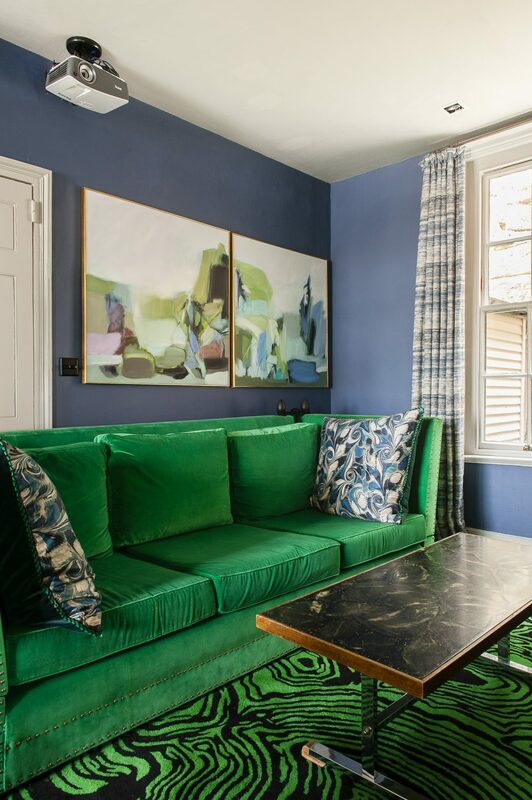 The curtains in here are in a very unusual multistriped felt in various shades of blue, complementing the blue walls – in the Captain’s Room next door, the curtains are the same fabric in shades of green, to go with the pale green walls. 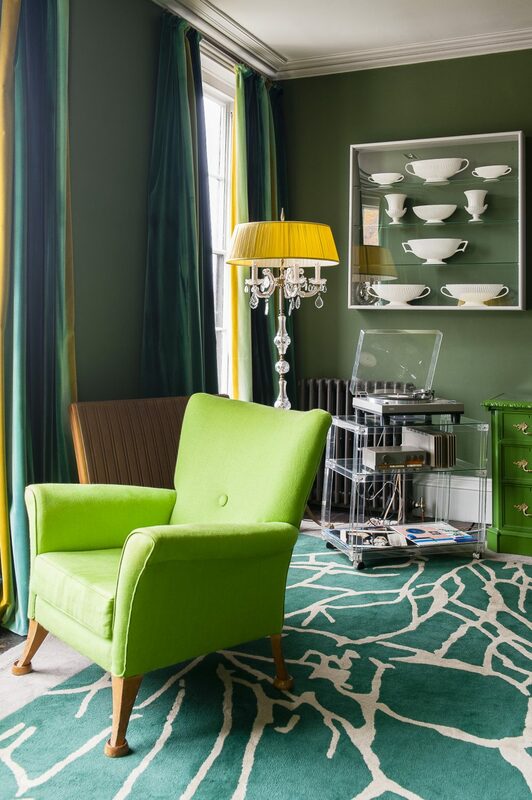 Both rooms also have a feature which is a theme of the house: glass fronted display frames containing massed collections of objects. In Cliff View there are 18 Poole Pottery dolphins in various sizes, while in the Captain’s Room, it’s ranks of porcelain posies. 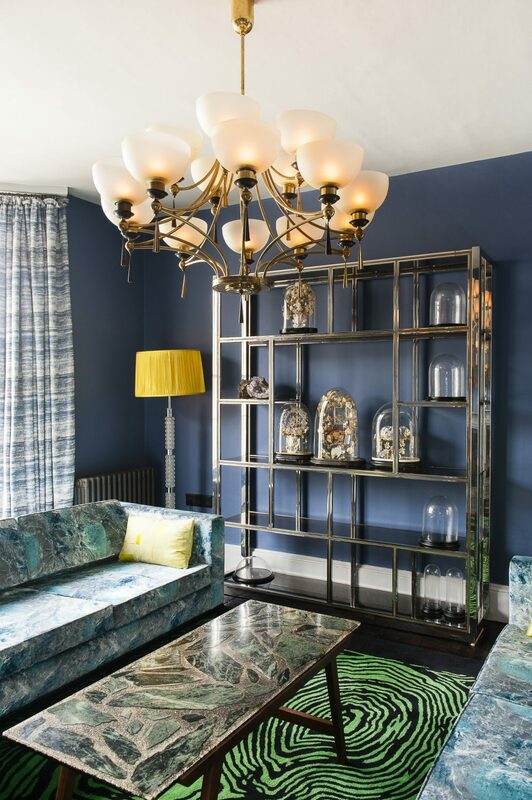 The idea to put the collections in the wall-hung glass boxes came from Shaun’s experience as a hotelier: “People can’t nick them.” But it’s also brilliantly effective. On their own, or even in groups of three or four, the posies would look twee and random, en masse they look witty and glamorous. 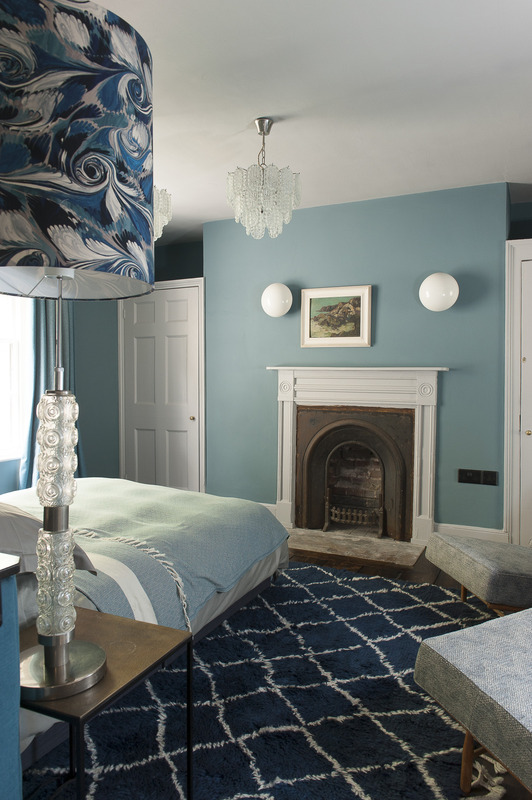 He also admits that the various musters (‘group’ doesn’t seem to convey the scale of them) around the house – there are white Wedgwood unglazed stoneware vases in the master bedroom – are a useful outlet for his tendency to amass collections of things. “I’ve got fifty Poole dolphins in total…” he admits. “I think I’ve got a shopping problem.” I think what he has is an amazing eye – and the imagination to see how something quite ordinary can be rendered very special. This jumps out at you in the bathroom on this floor (I found it hard to keep track, but if you want to get your head round it, there’s a very handy floor plan gizmo on the House in Hastings website). Its walls are covered in gold mosaic tiles. 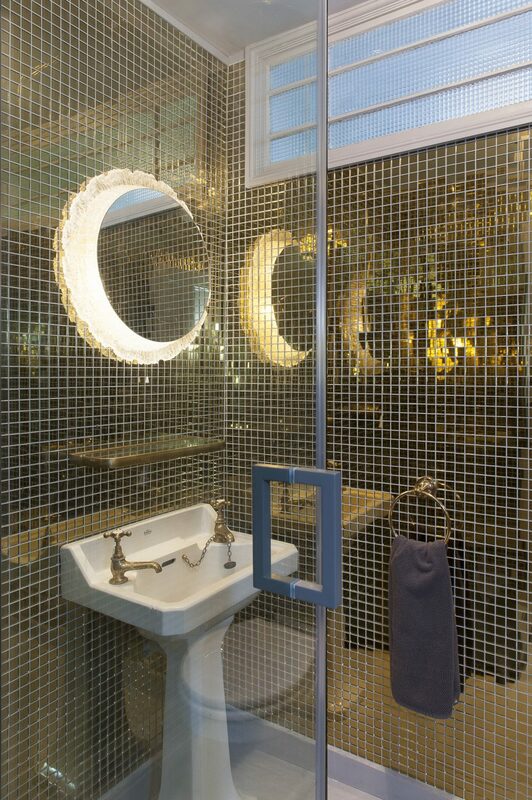 They call it the Mirror Ball Bathroom. “The nice thing about design is surprises,” says Shaun in response to my squeal of excitement on opening the door into it. 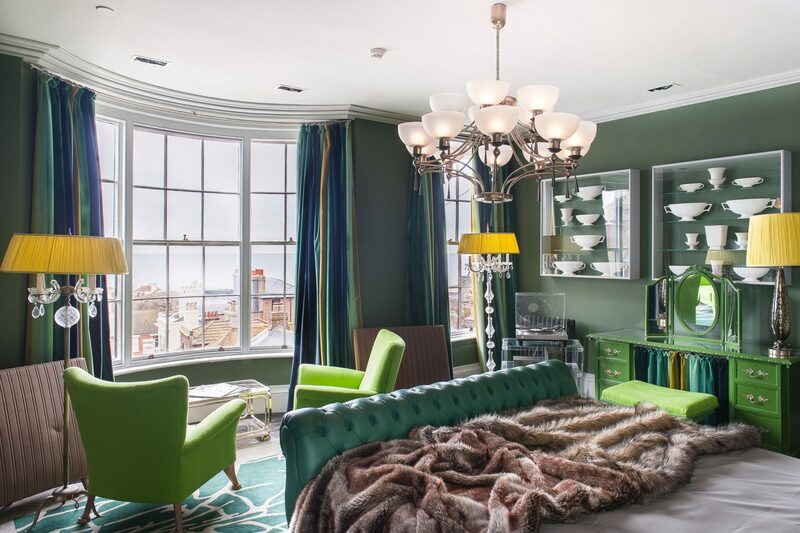 The wow factor continues one floor down, which is occupied entirely by The Admiral Suite, an eye-popping tableau of green fabulousness, encompassing the bespoke emerald green leather chesterfield bed frame, two Kelly green armchairs, the walls and a Louis Fooey dressing table and beside tables painted in demi-gloss Kelly. Looking out through the magnificent bay windows, you see that the colour picks up the grass on the East Hill opposite. 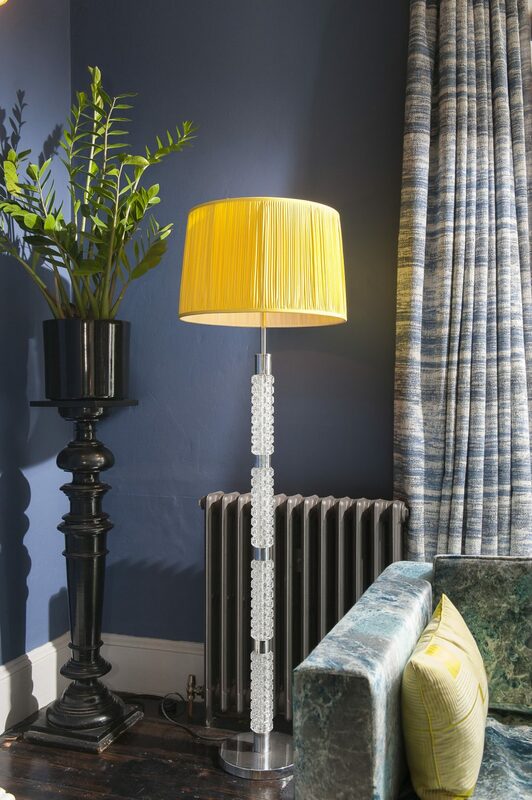 Yellow accents pop out around the room in the form of Shaun’s beloved bespoke (that word again…) lampshades, here in pleated yellow silk. 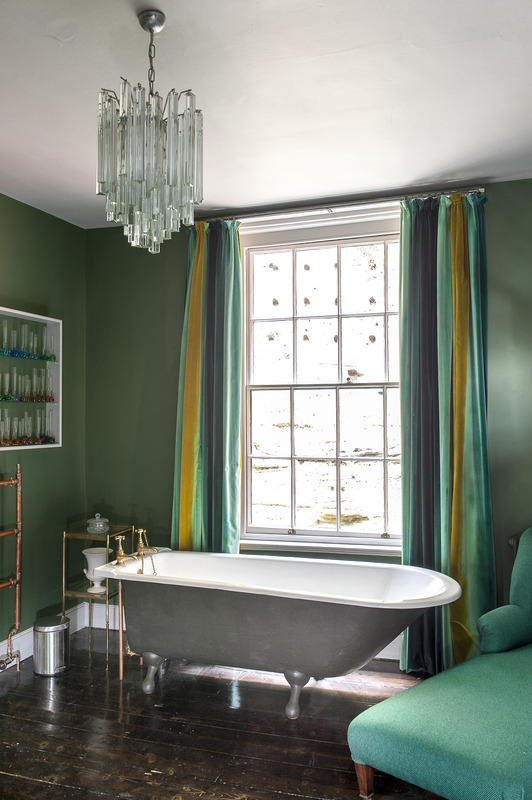 The large en suite bathroom – once a bedroom – continues the green theme on the walls and a chaise longue upholstered in emerald green tweed. 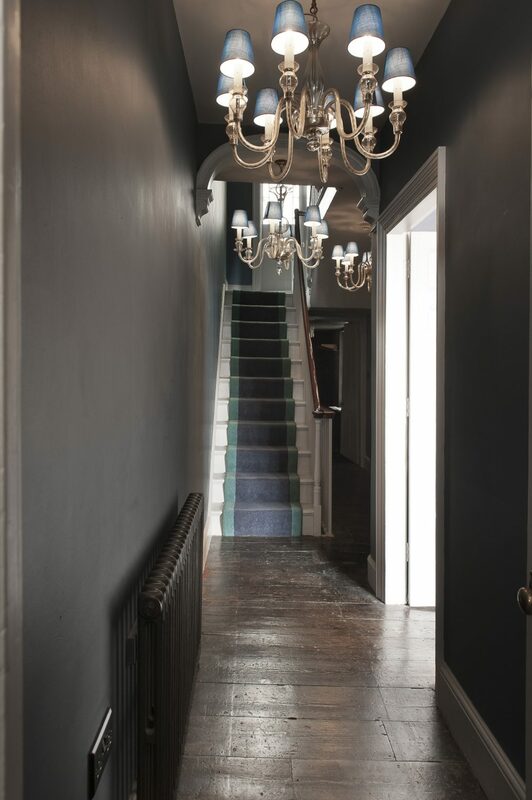 Down the stairs again and you’re on the upper entrance floor, up some steps from the front of the house, where the knocked-through salon encompasses a drawing room at the front and a screening room to the rear, united by matching dark grey and white marble fire surrounds (the second copied from the one original) and a pair of 1940s brass illuminated round mirrors, found at Clignancourt. 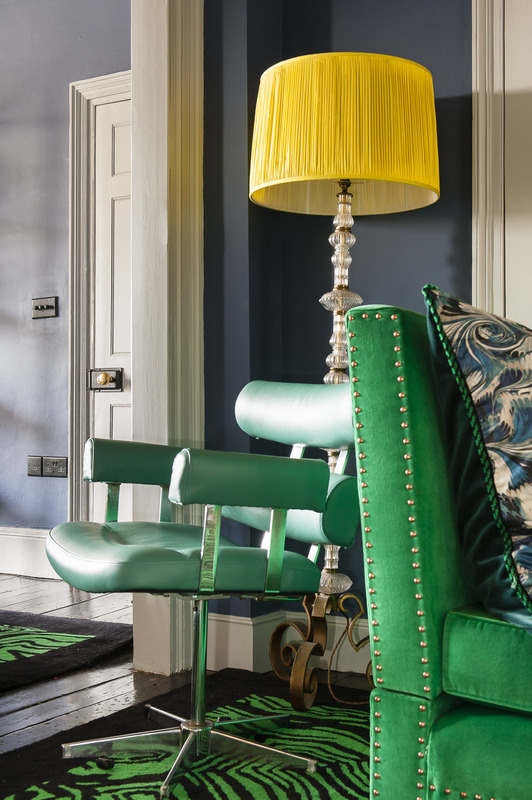 The décor of the whole is the ultimate union of Shaun’s blue and green theme, with unifying blue walls throughout, Kelly green velvet upholstery in the rear section and wonderful marbelised turquoise and blue velvet on the sofas in the front. 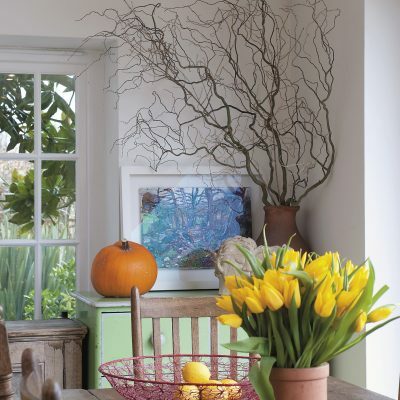 The bright yellow lamp shades make another appearance too. 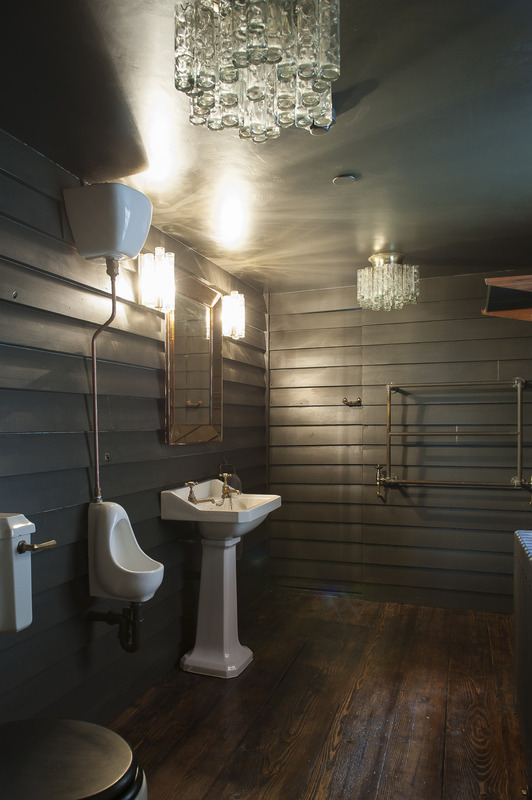 Also on this floor is the Net Hut Cloakroom – a guest loo rendered in tribute to the Old Town fishing community’s famous black wooden structures, the walls clad in horizontal black weatherboarding. Finally, down to the kitchen level, where the carpet eventually stops and the floorboards are painted in heavenly diamonds. 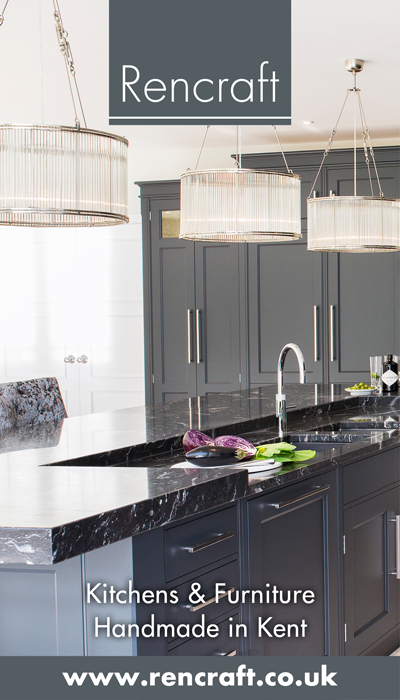 The main piece in the kitchen is a marble-topped stainless steel unit, Shaun had made (bespoke! bespoke!) to house the old stone sink. 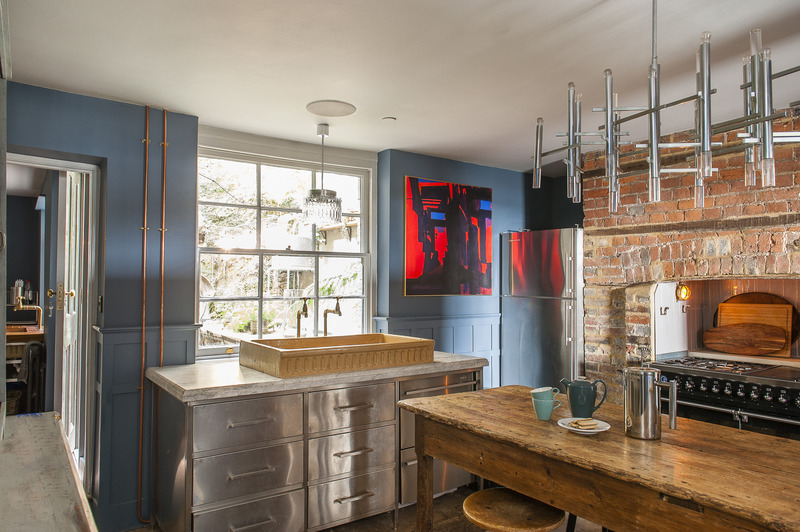 A prep bench/breakfast bar was created by raising the legs of a lovely old table. 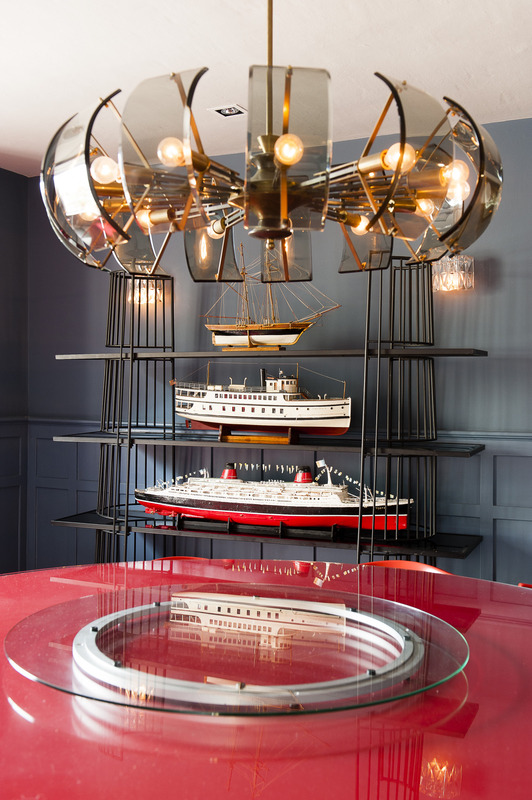 On the far side of the room, 1950s metal and wood bookshelves display three large model boats from Ardingly, while opposite, glass-fronted original cupboards on either side of the fireplace display musters of stoneware, cabbage ware, pewter, silver and crystal. 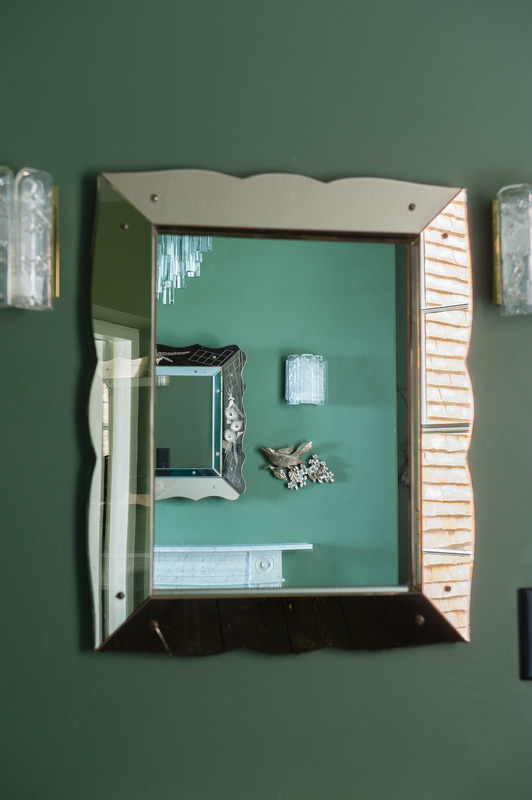 A collection of malachite lighthouses is grouped on the mantlepiece. It’s hard to think when one, relatively small, room packs so much punch. And that is the true theme of this extraordinary house. 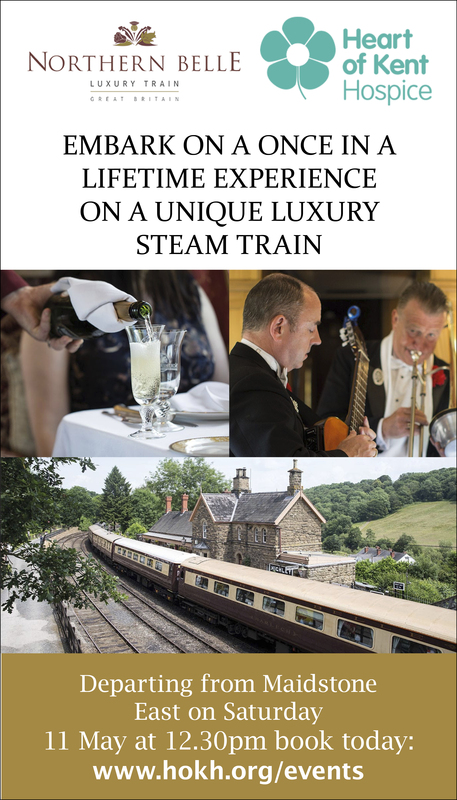 Even in this lengthy appraisal, there are too many amazing details to describe – and while they are what makes the whole so special, it is the combined effect, the theatrical drama and sheer confidence of it, which is so inspiring. 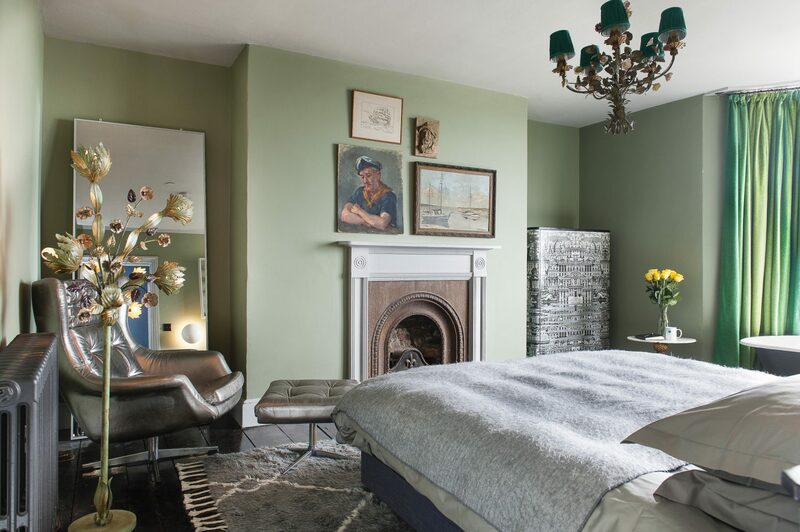 My advice, if you want to learn from Shaun’s talent and experience as a decorator, is study these pictures, scrutinise the website for the house and – best of all – go and stay in it. 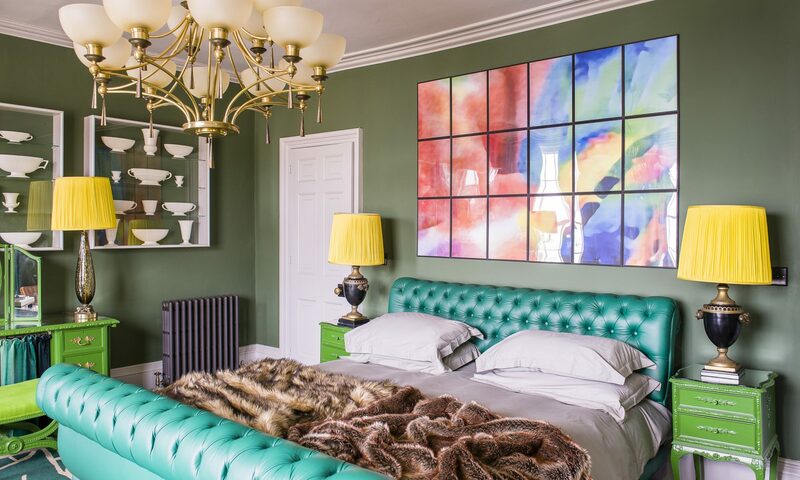 The stunning Admiral Suite is an eye-popping tableau of green fabulousness, encompassing the bespoke emerald green leather chesterfield bed frame, two Kelly green armchairs, the walls and a Louis Fooey dressing table and bedside tables painted in demi-gloss Kelly.